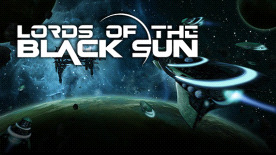 Lords of the Black Sun is an epic, complex, dense, turn-based 4X PC strategy game, set in deep space. Take command of one race to join the struggle for supremacy in the galaxy. As the leader of your empire you are tasked with exploring the stars, colonizing new worlds, managing your empire and conquering whoever dares to oppose you. The galaxy is full of secrets and dangers: Discover ancient ruins and artifacts, repel or befriend pirates, promote a general to guide your fleets to victory. Concoct complex plots with your allies or use your intelligence services to uncover weak spots on that threatening empire whose leader has vowed to destroy you. Make sure to keep your population happy or be prepared to face protests against your rule, or in a worst case scenario, rebel factions within your empire. Only the mightiest rulers can prevail in the depths of space. Are you up to the task of becoming a Lord of the Black Sun? 8 major races each with their own ship designs, technologies, unique traits and unique abilities, meaning playing with each race is a different challenge and offers new ways to approach the game. Big, living universe: In addition to the major powers, independent races and pirate clans also claim the galaxy as their residence; their existence can be an annoyance, or a blessing if you can take advantage of them. Deep economical and political layer: War isn’t the only way to weaken your rivals. Diplomacy, inteligence and trade can be one of many powerful tools that, if used properly, can be very effective as well. Create and customize your own ship designs. Generals: These unique and powerful units evolve as they battle and if used well can be the difference between defeat and victory. Randomly generated universe, tech tree and units: You will never play the same game twice. Empire shattering: Unrest might lead rebels to start a civil war which in turn might lead to the creation of a new, independent empire that might grow to rival your own. Plotting: Secretly finance a war against your rivals in order to weaken them or prepare a surprise joint war along with your allies in a bid to destroy that frighteningly fast growing empire. Lords of the Black Sun © 2013 Arkavi Studios. Developed by Arkavi Studios. Licensed exclusively worldwide to and published by Iceberg Interactive B.V. All brands, product names, and logos are trademarks or registered trademarks of their respective owners. All rights reserved. Made in Europe.